"...you cannot jump - instead, you reverse your own gravity at the press of a button." I really like this game. In fact, I'd beaten it once already before deciding to play through again for this post. It's very short, lasting only a handful of hours, but it packs quite a bit of challenge. The game uses pixel art, which is rather common for indie games. However, the game heavily restricts its palette, with every object only having a single color. each 'screen' has its own color, which everything adheres to(minus the player of course). There are only a few different colors across all of the areas, but they're all quite bright and saturated without becoming painful. Just for laughs, there's also an option to make the game look like it's being played on an old television. It'll mess your timing up occasionally, but it's still a fun effect. One issue that I felt I had to bring up is that the game's actual resolution options are rather limited, allowing you to only play the game at 1-4 times the original size. I understand that the creator wanted to make sure that the graphics didn't stretch, but the four options given feel pretty limited. The game's controls are quite simple, and it can be played with four or so buttons, period. You can move left and right, and pressing a button(there are several options) while on the ground causes gravity to reverse. The game has very few elements beyond solid objects and things that will kill you instantly. Despite such simple mechanics and elements, the game can become astoundingly difficult, especially if you're going for 100% completion. Having said that, while the game is challenging, it is hardly punishing. There are checkpoints everywhere, so death will usually only set you back a jump or two. If I recall correctly, the game tells you your death count when you win, and it may surprise you just how quickly that number adds up. Well, you don't see too many platformers that don't let you jump, that's for sure. Another impressive thing that I failed to mention before are screen names. 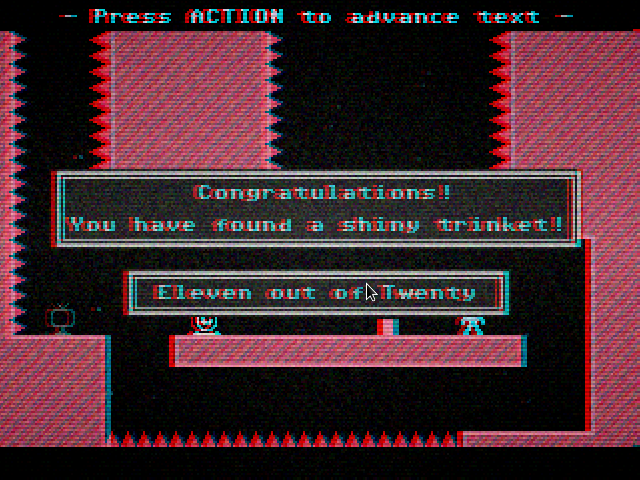 Each screen-sized section of the levels is named, often in clever ways. For instance, two sections that you have to switch between several times while avoiding spikes are named 'I'm Sorry' and 'Please Forgive Me.' It's not too important, but it's for an interesting touch. As the story is about rescuing the crew of your ship, and the world is so open, you can save each member in whatever order you like. Topping this off, the order that you choose can lead to some changes in dialogue. It's another little detail that, while not entirely necessary, is certainly pretty cool. 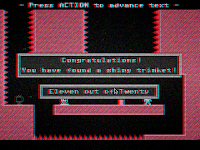 Overall, VVVVVV is a fun, colorful, and challenging game. The only major thing I dislike about it is that the player tends to slide. It's not too uncommon to run into a situation where you made a jump perfectly and then slid right off the platform into some spikes. Despite that, though, you won't get too frustrated until you try and get all of the collectibles. The game's simple controls make it easy to get right into the action without any trouble, and returning after a break is pretty easy. Finally, at 5 dollars, it's not exactly a risky purchase. I would certainly recommend this game.